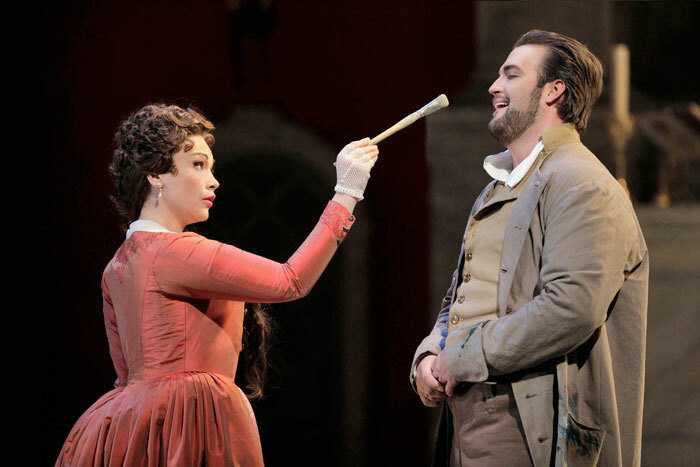 Opening at the War Memorial Opera House this week, San Francisco Opera’s new production of Tosca stars Italian soprano Carmen Giannattasio in the title role, with tenor Brian Jagde as Cavaradossi, and baritone Scott Hendricks as Baron Scarpia. British conductor Leo Hussain – formerly music director of Opéra de Rouen and Salzburg Landestheater – makes his first appearance for San Francisco Opera, and staging is by American director Shawna Lucey who was responsible for last season’s highly successful production of Verdi’s La Traviata. Sets and costumes are by Robin Innes Hopkins, who has previously worked with the Company on Janáček’s The Cunning Little Vixen in 2004, Rossini’s L’Italiana in Algeri in 2005 and Wagner’s Lohengrin in 2012. Lighting is by Michael James Clark, and the fight director is Dave Maier. Giacomo Puccini’s Tosca – written in 1899 – was based on Victorien Sardou’s 1887 play, La Tosca, which featured the actress Sarah Bernhard in the title role. Set to a libretto by Luigi Illica and Guiseppe Giacosa, this historical melodrama of love, lust, treachery and corruption takes place in 1800, when control of Rome by the Kingdom of Naples was threatened by Napoleon’s invasion of Italy. It recounts the story of artist Mario Cavaradossi and the woman he loves, singer Floria Tosca, as they try to evade the corruption which was rife in the city of Rome at that time. Tosca premiered at the Teatro Costanzi in Rome on January 14th, 1900. Carmen Giannattasio is regarded as one of the finest exponents of bel canto opera today, with a repertoire which includes works by Verdi, Puccini, Leoncavallo, Bellini, Rossini and Donizetti. She makes her San Francisco Opera role and house debuts in this production – her first US performance since appearing at the Metropolitan Opera in La Traviata in 2017 – a performance described by Opera Wire as “sensational”. Ms Giannattasio won first prize at the 2002 Plácido Domingo Operalia Competition, and having initially appeared in most of the major opera houses across Europe, she has since appeared in some of the great companies in other cities of the world – The Royal Opera House, Covent Garden, the Bolshoi Theatre Opera, and the Metropolitan Opera. Performances scheduled for this season include the title roles in Maria Stuarda at the Théâtre Champs-Elysées, and Norma at Bayerische Staatsoper in Munich, and she will also be appearing in Don Carlo at Opera de Las Palmas, Giovanna D’Arco at Teatro Real de Madrid and in Ermione at Teatro di San Carlo in Naples. Brian Jagde, Merola Opera Program alumnus and San Francisco Opera Adler Fellow, is now regarded as one of the leading tenors of his generation, having appeared to great acclaim at London’s Royal Opera House, Deutsche Oper Berlin, Munich’s Bavarian State Opera, Moscow’s Bolshoi Theatre and the Arena di Verona. According to a review in of Das Wunder der Heliane at Deutsche Oper Berlin, which appeared in NDR.de, Brian Jagde “projected his golden, flowing, and warm voice over the massive orchestra. It was very understandable why Heliane falls for his charisma”. 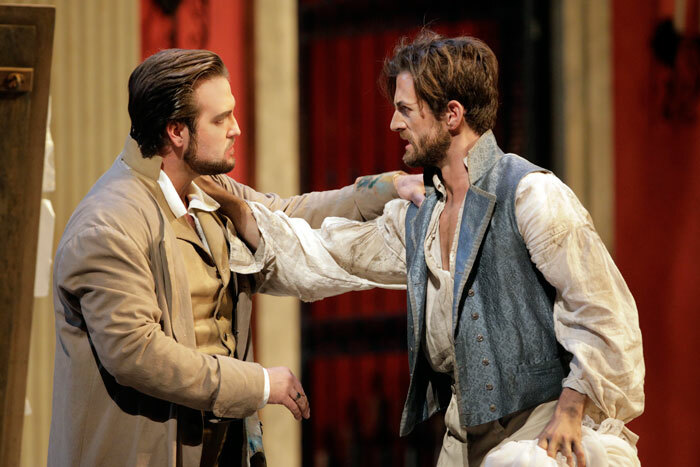 This year alone has seen Brian Jagde appear as Cavarodossi in the Teatro di San Carlo production of Tosca, as Don Jose in a new staging of Carmen at the Arena di Verona, as well as his Russian debut in the same role in the Bolshoi’s production of Carmen. Scarpia, the corrupt chief of police in Tosca, is sung by American baritone Scott Hendricks, who has received acclaim for his portrayal of this role in appearances at The Royal Opera House, Covent Garden, the Opéra National de Paris, the Bregenz Festival and Munich’s Bavarian State Opera. Future engagements this season include the role of Barnaba in Ponchielli’s La Gioconda, and Victor Frankenstein in the world premiere of Mark Grey’s Frankenstein (both for La Monnaie), and the murderer in the world premiere of Moritz Eggert’s M – Eine Stadt sucht einen Mörder for Komische Oper Berlin. Also in the cast of Tosca are bass-baritone Dale Travis in the role of the Sacristan, tenor Joel Sorensen is Spoletta, baritone Hadleigh Adams sings Angelotti, baritone Andrew Manea is Sciarrone and bass-baritone Christian Pursell is the Jailer. 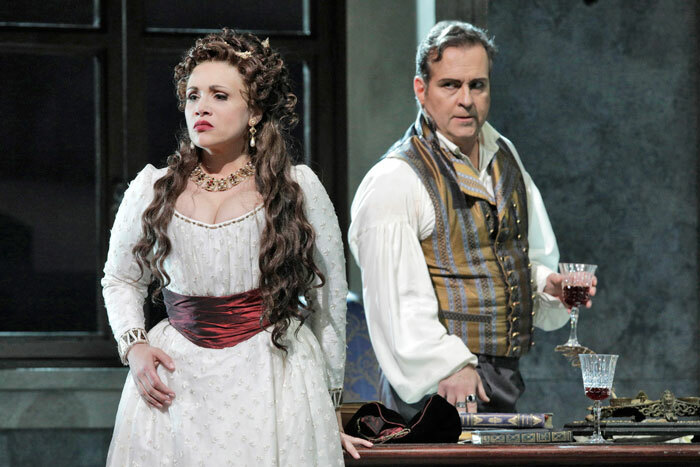 Tosca has a special place in the history of San Francisco Opera. It featured in the Company’s inaugural season at the Civic Auditorium in 1923, and it opened the first season in San Francisco Opera’s new home, the War Memorial Opera House, on October 15th, 1932. 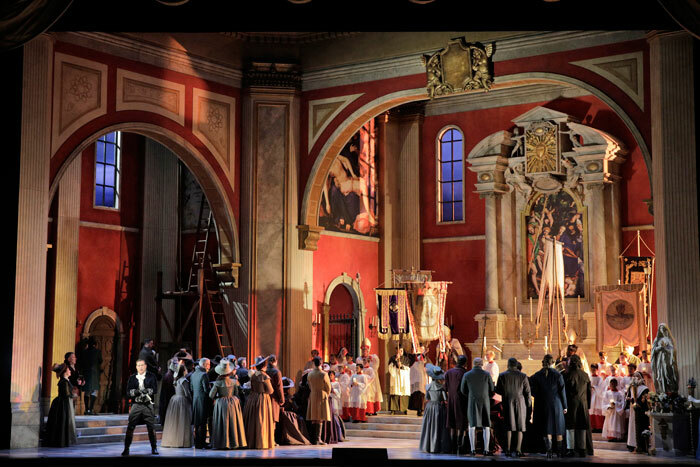 Leo Hussain leads the San Francisco Opera Orchestra, Chorus (Director Ian Robertson) and cast in Puccini’s Tosca at the War Memorial Opera House. 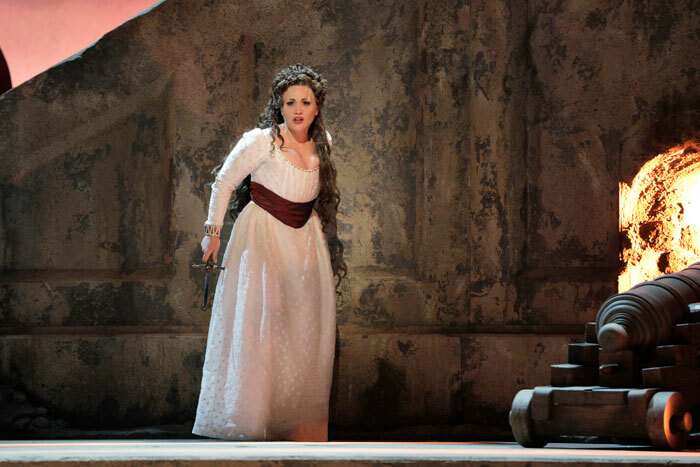 Sung in Italian with English supertitles, Tosca runs for eight more performances until October 30th. For further information and tickets, visit the San Francisco Opera website.